This interesting star sign is part of the Greek mythology involving Phaethon, the son of Phoebus and Clymene. He persuaded his father to allow him to take the chariot of the sun for one day. His father was very hesitant to do allow him, and for good reason, because the boy could not control the fiery steeds. The result was a careening ride through the heavens. To save the world from disaster, Jupiter shot a thunderbolt, striking Ph aethon and killing him. Again, it’s easy to see how the ancient mind endeavored to account for the fact that this constellation is associated with fiery judgment and the death of a god’s son. The Gospel of Jesus Christ perfectly explains it! His death (and resurrection) WILL RESULT in the fiery judgment that is so dreaded by the powers of evil. This region of the sky has always been associated with a fiery judgment. It is amazing that the instrument of God’s divine wrath seen in this region of the sky is a river of fire. This is a reminder that, just as God once destroyed the world with a flood, He will once again destroy it, but this second time with fire. Both ideas are seen in this one picture. But how do we know that it is a river of fire? Such a thing sounds impossible. We know from the meaning of the name of this sign. Eridanus means “river of fire.” Also, if you download your free E-book, you will read a poem by an ancient poet who also identifies this as a river of fire in his poem. So, we see that the return of the Lord Jesus (which Book Three speaks of) will bring with it the fiery judgments that are so graphically described and prophesied in the book of Revelation in the Bible. This is a stream of fire coming out of Orion’s uplifted foot (the one that has always been pictured as bruised — See Genesis 3:15 and Ophiuchus and Scorpio). Yet in this picture, the so-called cripple has become the crusher! The stream of fire continues to the forepaws of Cetus, the sea-monster, who tried in vain to stop its awful flow. As Orion continued the theme of the Lord’s Second Coming in power and judgment, this sign gives more details of that most amazing of all events in human history. Notice that this is associated with a river of fire, and that the theme is one of fiery conflict. Aratos (the poet) called it the “scorched water of Eridanus’ tear-swollen flood.” (See Free e-book) This is the picture of the idea of the final judgment and the deep regret for past sins. 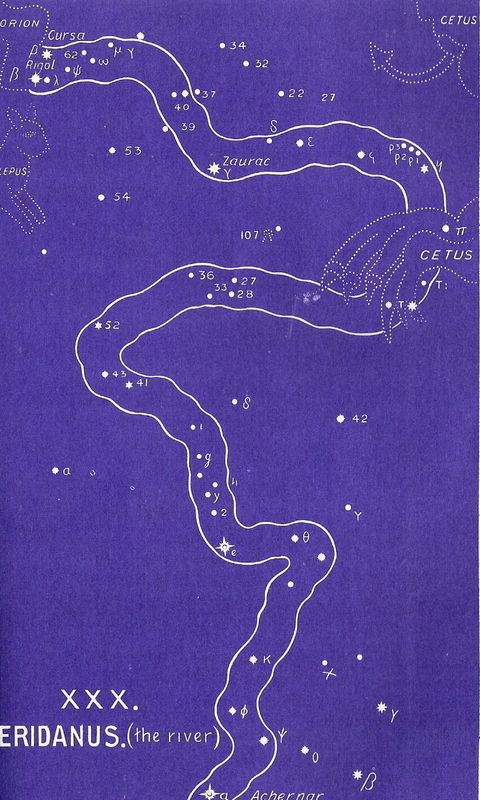 To continue in the correct order of the ancient star chart, please select Auriga next.